Hi there! Are you budget travelers or backpackers who are going to stop over in Jakarta? Are you looking for budget hotels? There are a lot of budget hotels spread all over Jakarta. As a Jakartan, I’d recommend you three streets in Jakarta for your stay. Why? As a budget traveler I want to stay in an area that is close to the city’s attractions and things that I need as a stop by-er. For those who visit Jakarta for the first time, the bad traffic on peak hours will choke you. This is not to add with weather like the rains. I don’t wish you to stuck in the traffic if you only have one-night stay in Jakarta. So, finding a place to sleep in the central area is essential so you can comfort yourself. Here are my recommendations for you. Remember, this is for budget travelers. Jalan Jaksa has been famous as a backpacker area of Jakarta since 30 years ago. It has been a backpacker’s hub in Jakarta. Now, the lodgings offered for backpackers also include budget hotels. The hotels, homestays or bed and breakfast here are a bit crowded. If you are a light sleeper, you need to consider to find a place that is a bit quiet. This is because the cafes or bars there last until over mid-night. Bars? Yes! There are bars here where you can drink alcohol. The street is not long. What you need are on the reach like restaurants, cafes, money changer, bank, tour operator, and convenience stores. ). If you are a walker, you can walk to Monas Park from Jalan Jaksa. Jalan Jaksa is reachable from any ends of Jakarta. How much should you put aside for the lodging here? The room rate depends on the room and accommodations types. I can say, it is between $20-40 per night. But the accommodations quote their prices in local currency (rupiah). Jalan CikinI Raya is a one-way strategic street located in Central Jakarta. 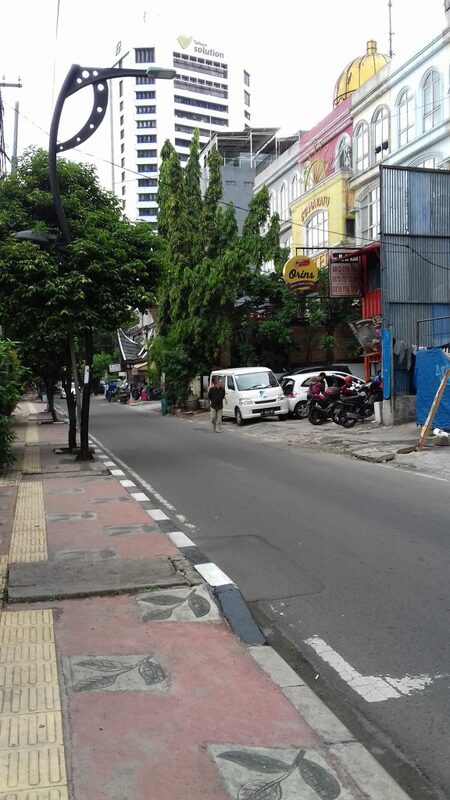 It is one of the old historical streets of Jakarta. You still can find a remaining row of shop houses from Jakarta old time that now house cafe and restaurants. There are also some budget hotels including the one from chain international hotel. Some new capsule hotels also operate on this street whose rate is about $10 per night. The restaurants, bakeries, cafes, banks, pharmacy and convenient stores are easy to spot. If you like art, the oldest art center, Taman Ismail Marzuki, is on walking distance. You can see the art performances and art exhibitions here. A cinema is situated inside the complex of Taman Ismail Marzuki. Jalan Cikini Raya is between two stations, Gondangdia and Cikini Stations. You can commute with the commuter line if you stay on Jalan Cikini Raya. In the evening, you can find many food street vendors nearby Cikini Station. The street is also only about 5-10-minute drive from Central Station Gambir. Jalan Raden Saleh is not far from Jalan Cikini Raya. It is named after a well-known Indonesian painter. It’s a busy street during the peak hour. There are business office, commercial shops, hotels, restaurants, banks on this two-way street. The area is best for its Middle East restaurants. The most expensive restaurant is also on this street. U.S. President Bill Clinton dined in there as he was visiting Jakarta. Don’t worry about the hotel, there are some budget hotels on the street. Street food vendors are many in the evening. Convenient stores, ATM, money changer and tour operators are also easy to spot. The location is also about 15-20 minutes from Gambir Central Station by car. The three streets I mentioned are busy one. You may find them noisy, but you can opt for rooms and accommodations that are not by street. So, happy hunting and enjoy Jakarta!